There are many reasons to give your birds an outdoor aviary. 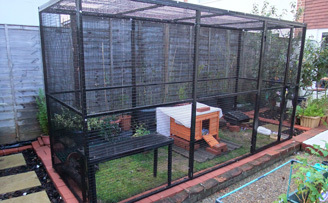 A large aviary gives your pets space to move in a more natural environment. 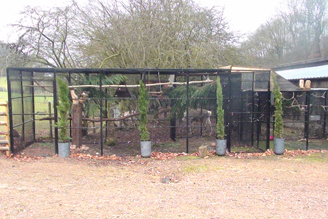 Our aviary panels are modular they come in 4ft and 2ft widths by 6ft high, this allow you to make as large an aviary as you wish. It also allows you to add to it later. 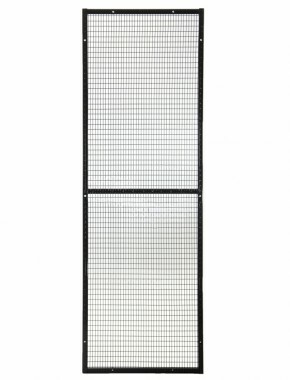 The aviary panels have bolt holes through both faces making any aviary panel either a corner or a side. This makes it even easier to change the shape or add to the aviary in the future. Your birds will thank you for the access they get to fresh air and unfiltered sunlight. The below calculator works out the cost of an aviary of any given size. Select your sizes. 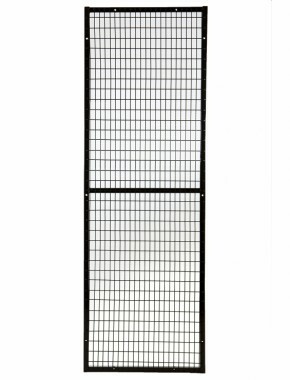 The normal height is 6ft (1.8m) but we also offer 1.2 and 2.4m options. Select your mesh size. 2" x 1" for parrots i.e macaws and African greys, or small mesh 1"x1/2" for small birds such as Finches. The calculator produces the panel list for the cage you require that can be then added to your basket in one go. 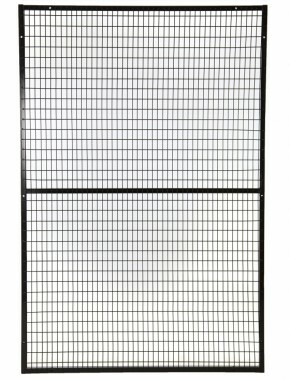 The more panels you have the cheaper they get, don't be suprised if the aviary panels in your basket get cheaper when you add more. These are example kits, Any size combination of 2ft and 4ft can be made using the panels below. If you want to discuss any of our Bird aviaries and the possibilities, one of our friendly sales staff would be very happy to speak to you. This is a 4 sided aviary 4ft square by 6ft high with a roof. 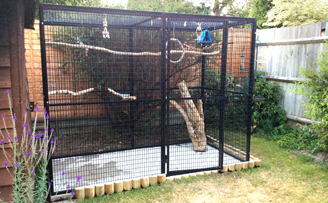 This is an 8ft x 8ft aviary 6ft high with a 2ft x 4ft entrance including 2 doors to stop the birds escaping. 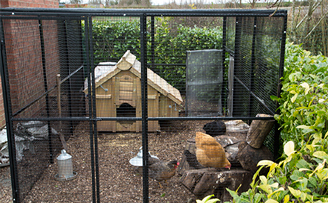 A large aviary gives your pets space to move in a more natural environment. 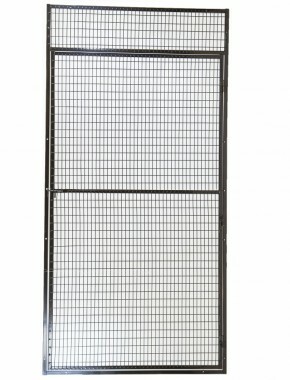 Our aviary panels are modular they come in 4ft and 2ft widths by 6ft high, this allow you to make as large an aviary as you wish. It also allows you to add to it later. The aviary panels have bolt holes through both faces making any aviary panel either a corner or a side. This makes it even easier to change the shape or add to the aviary in the future. Your birds will thank you for the access they get to fresh air and unfiltered sunlight. What size aviary should you choose? It is advised a minimum aviary size of 3 times the wing span. A flight that is 4ft x 8ft and 6-feet tall would house a group of about 20 budgerigars, budgies, parakeets, cockatiels, or a pair of African greys or Amazon parrots. 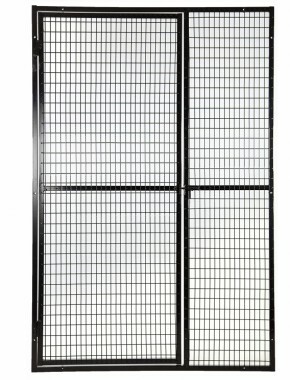 The panels are manufactured from 2" x 1" Welded Mesh with 3mm diameter wire with a 25mm box section frame which are galvanized then black powder coated. If you have a wall you wish to incorporate into the pen you can attach our panels with wall plugs using the holes already available in the panels. As the system is modular it can be taken down quickly and reassembled. This allows you to move the run around. Bird Cage accepts padlock under latch. Small Aviary mesh or large mesh? 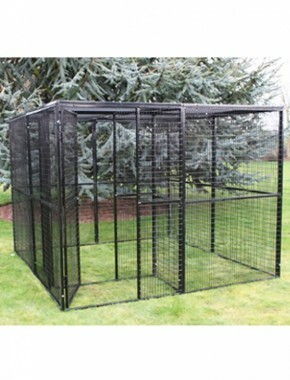 The smaller mesh aviaries are suitable for smaller birds such as Finches and budgerigars. 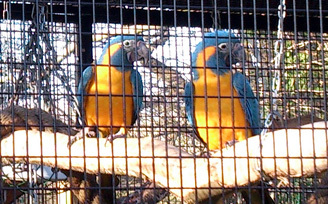 The Larger Mesh aviaries are suitable for African Grey, Macaws and other large Parrots. You don’t want to use a smaller mesh for the larger Parrots as they can get their feet and beaks trapped. Both types of mesh will keep out rats. 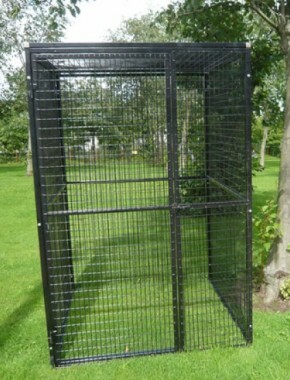 All our aviary panels are electro galvanised and then black powder coated. An electro galvanised coating does not leave bits on the wire and is a very smooth coating. Hot dip galvanising sticks to any dust or weld splatter. The problem is that when parrots chew the mesh they can ingest these zinc particles which can lead to them losing their feathers. 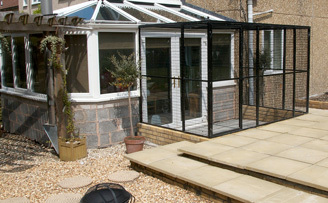 Our aviary panels are black coated for an attractive appearance and extra lifespan. They are also thicker than other aviary panels in the market. 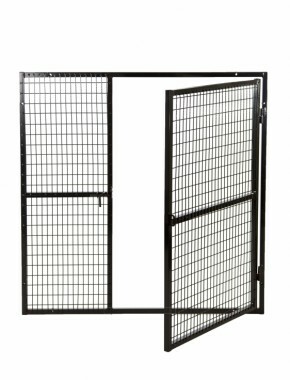 All the cages come with a single door 4ft wide (the opening is 700mm), the aviary doors can be put on any side of the cage. You may wish to have a double entrance to the flight to stop the birds escaping. 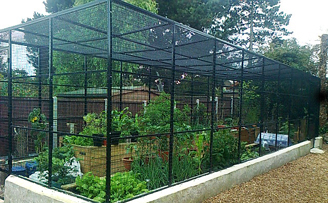 This is easy to achieve but the extra panels required differ depending on which shape of cage you use. It’s best to give us a call to discuss what panels to add, it’s normally an extra gate and a 2ft panel. If you want to speak to us at any time or want any advice we would be more than happy to help and offer advice. 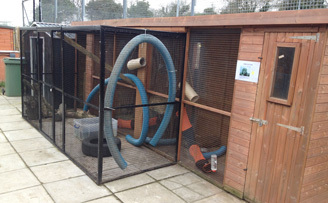 If you are worried about foxes in an outdoor aviary situation you can either put a mesh base on the cage, this is the same as the mesh roof. Alternatively you can put down a concrete base. 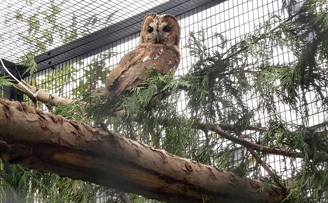 If the birds are to spend long periods of times in the aviaries, make an area of the cage sheltered. You can do this using sunshade netting or if you wish to make a completely waterproof area you can buy profiled roof sheet separately and attach to our mesh roof panel using self tapping roofing screws. If you’re putting perches within the cage try to keep them away from the edge of the cage so Cats or other small predators cannot reach in. 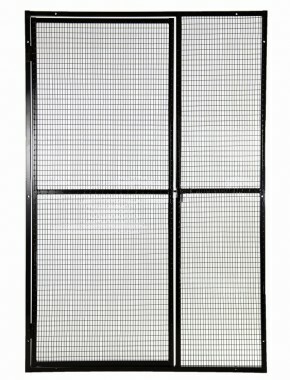 Our Aviary door panels accept a padlock which prevents human intruders gaining access. Give your pet bird time to get used to its new surroundings. Your pet birds will love their outdoor aviary. We discount based on quantity, if you input your quantities in the table and click the update button it will give you your discounted prices based on the total no. of items selected (in all rows). This also takes account of other items you have in your basket. To use the calculator. Select if its 4sided (freestanding), 3 sided (against a wall 2 sides have to be the same length)or 2 sided (in a corner). Select with or without a roof, the roof is the same mesh construction as the sides. Finally input your sizes and press the calculator button.